This is the story of a pig. 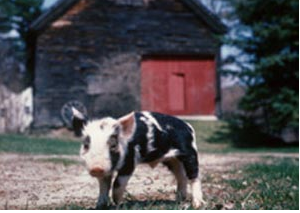 A pig who “outlived everyone in his class by thirteen and a half years”. His is a story of survival, and not just his own, but of all those who had the privilege of knowing him. His name was Christopher Hogwood. A good piece of writing is hard to come by – what with all the content online and offline masquerading as worthwhile reading material. A good book is probably harder to come by – what with all the content online and offline masquerading as worthwhile reading material. The Good Good Pig – The Extraordinary Life of Christopher Hogwood by Sy Montgomery is a good book. It doesn’t pretend to be a literary masterpiece. Neither does it purport to shove ideologies down readers’ throats. It is respectful of its readers’ sensibilities and quietly urges them to think more deeply. All through the simple telling of the story of an amazing pig. For those who are already convinced of the cruelty of factory farms and for people who humbly acknowledge their place on Earth, The Good Good Pig validates the decision to adopt a life of peaceful co-existence with all sentient beings. More remarkably, The Good Good Pig could potentially move the cynic to deeper reflection and thought. Three things about the book stand out: a thought on ecological balance, the dynamics of an evolved human-animal relationship and spirituality. On human-animal relationships, which is the point of the book, her perspective on the predator (and pest) issue is particularly insightful. Many things about The Good Good Pig would resonate with readers who have pets who they pamper; most especially how the author refers to her animals. To me, too, my cat is “someone”, “who”, “he”. Perhaps this gives some insight to her spirituality. Not quite the same thing as religiousness, mind. Sy is a Christian woman, but not all Christians feel the same way about animals. Or about God. Similar to Sister Francoise Bosteels and her dolls, The Good Good Pig speaks a quiet activism. One of love. Sadly, the National Library of Singapore has proven that it is NOT a great library after all. As much as I have been pleased with its efficient lending services and attempts at conducting useful workshops for the public, its knee-jerk decision to pull two books from the children’s section, namely “And Tango Makes Three” and “White Swan Express”, demonstrates a non-commitment and disrespect to its supposed mission as a public service. Shame on you, National Library Board and shame on all those who support your decision. They are evidently people who are incapable of making independent decisions and who are only all-too-willing to shirk their responsibilities as parents (if they are, I pray for their children) rather than take that responsibility squarely on their own shoulders. If you don’t like it, don’t borrow it.